Leanne Manas is the popular face of SABC’s flagship breakfast program, “Morning Live” on SABC 2. Prior to this she was the host of two Business programs on SABC 3: Business update and Business Focus. Leanne was also chosen as the National Anchor for the 2004 elections and Presidential Inauguration. Leanne is also an Ambassador for Nelson Mandela’s “46664” campaign. She is the only Television anchor in the world to join the elite list of Ambassadors handpicked by Madiba. She started off her television career as the main news anchor for South Africa’s essential Business Channel – Summit Television. Leanne has also done extensive work for radio stations across South Africa including Radio Algoa, Jacaranda and East Coast Radio. You can also occasionally hear her on SAFM’s media show and Market update. She is a qualified Speech and Drama teacher, and also has an Honours degree in English. Leanne started her career as a news anchor at Radio 702 and then moved to Johnnic Publishing’s African Business Channel where she became the news anchor for Classic fm. She then took a keen interest in Finance journalism and completed a postgraduate certificate in Economics Journalism from Rhodes University. In her spare time she teaches Television skills to students at On Cue Communications. Leanne has interviewed hundreds of Top Businessmen and women, Politicians and entertainers in South Africa and from abroad. Her most notable achievements thus far are her one-on-one exclusive interview with Oprah Winfrey and Nelson Mandela. Diana Ross, Christina Aguilera, Seal, Sir Richard Branson, Joan Armatrading, John Legend, Jane Seymour, Ronan Keating, Palestinian freedom fighter Laila Khalid and the Reverend Jesse Jackson are just a few of the other people Leanne has had the opportunity to interview. 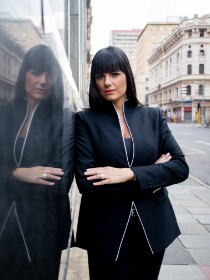 Leanne was one of the nominees for Sanlam’s Business Journalist of the year awards in 2002. She was voted as one of Cosmopolitans Most Awesome Woman of 2004. Leanne also walked off with the Sunday Times/Elle Most Stylish News/actuality/continuity Presenter award for 2004. She also won 2 awards at the People magazines “Crystal Awards”, Best Female Television presenter in SA and best dressed presenter for 2005 and 2006. She also walked away with “You” Magazines most as Stylish TV presenter for 2006.